The top human rights ombudsmen of 53 countries meeting in Merida adopted a declaration to be conveyed to the United Nations proclaiming that human rights are essential for sustainable development. The Mexican Ombudsman, Luis Raul Gonzalez Perez, who presided over the meeting Oct. 8-10, said Sunday Oct. 11 that the principles of human rights and peace and security are fundamental for sustainable development. 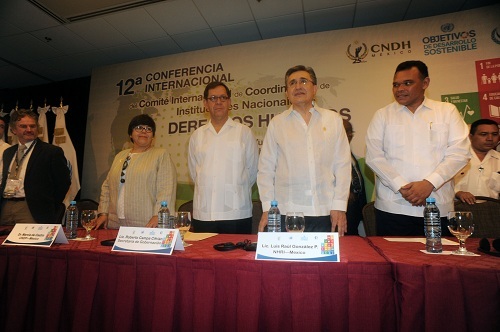 The 12th International Conference of the International Coordinating Committee of National Institutions for the Promotion and Protection of Human Rights, unanimously approved the Declaration of Merida. This manifesto, signed by the Ombudsmen of the 53 participating countries, will be incorporated in the Human Rights Agenda for Sustainable Development 2030 issued ​​by the United Nations General Assembly last September. 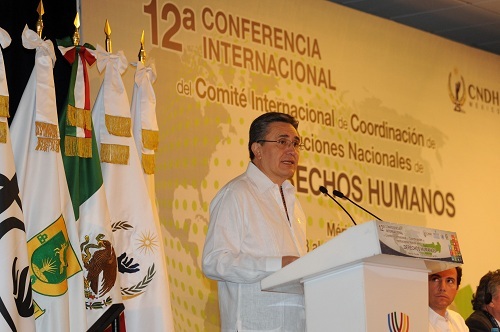 The Mexican Ombudsman, Luis Raúl González Pérez, who led the work of the meeting, said that the 2030 Agenda provides a framework for unprecedented transformation, applicable to all countries, linking environmental, social and economic dimensions of development in order to restore harmony and balance of the environment. “Our role as national human rights institutions is to serve as a bridge between stakeholders in national processes and government institutions, national statistical offices, civil society, and particularly more vulnerable people,” Gonzalez said in a statement. The 53 participating countries will monitor progress in the implementation of Agenda 2030 at the local, national and regional levels, reporting on structural inequality and discrimination, and identifying barriers and actions for accelerated progress. The Merida conference took place at the Hyatt Hotel in the Garcia Gineres neighborhood under relatively tight security measures. No protests or other incidents were reported.